I agree, Didi, Kidnapped is a difficult book because the style is somewhat dated, though the story is exciting. But little holds a candle to Mockingbird, though I actually started to write this post about The Kite Runner. Given what I know of you through your blog, you will love The Kite Runner as much as I did. It was the first book in about five years that caused me to cry through the final four pages or so. About three minutes later, I felt myself breathing again – yes, it is that good. Didi, I do think you’ll love it. You’re developing quite a collection of great books, Shari. Many I’ve read, but you remind me of those I still need to consume. From She-Who-Reads-While-She-Sleeps? You far outpace me at reading, and my to-read list is now about 10 pages long – partly your fault! In a good way of course. Heehee. I’ve taken to planning my writing while walking the dog. I take the same path every day so can go on autopilot. The story just arrives. OK, that was a tangent, but we haven’t had coffee in quite a while so I haven’t been able to chat with you about life. Obviously I need to get a dog. Companionship, required regular walking, thinking along the route – yep, must get a dog. The next dilemma is easily solved. Send me a date or two. Not Medjools. Wow, you have really opened the door of doubt. It may be a real possibility that she penned so little of Mockingbird and knew that she could never again attain that level of literary mastery. It would certainly explain why Lee hid from the public and never wrote again. If true, we’d all have to wonder – who was the real mastermind behind the story? It could have been Tay Hohoff, but would she risk her reputation to do something like this? And why would she? Could have been Capote, could even have been Lee’s sister Alice. Oh boy, another conundrum to place beside the one about Shakespeare. I’d never thought of this angle but now you have me wondering. And now I may end up reading Watchman just to make my own comparisons. I will be looking into your book – it sounds very intriguing. It deals with all the questions you just asked and turned into a pretty good plot line in the end. If you go to my pages on the menu entitled Mystery, you’ll see the book cover we’ve been designing. It’s not done, yet, but I welcome any suggestions. Thanks, Sharon. Clare, I’ll head on over to your blog site very shortly. Very intriguing. Indeed required reading at school and I neither liked it or even ‘got’ it, so I should prob read it again. I did like Kidnapped though. Another school book from memory! Thanks for your comment. School makes a bigger impression than we might realize until we’re much older, don’t you think? I don’t know. I think I was in my thirties before I really put things together! I’m way older than thirty and still trying to put things together. 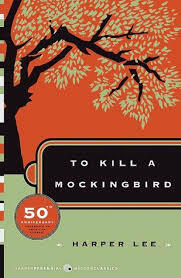 I loved To Kill a Mockingbird, and your review is great! Also, other books for K, The Kite Runner is one book I really liked too. This was a complete joy to read, Sharon. As a Southerner, this book is a favorite of mine. I agree with all you have said here, though I did make the mistake of trying to read Watchman, and couldn’t get through it! And I also think it’s rather criminal that Lee, in her dotage, obviously had little say so in Watchman’s publication. I know many who didn’t buy the book for this salient reason. Also, your comments on being willing to revise are very timely for me; I was so thrilled to read what you wrote, and take you seriously. My third book is at issue with an editor, who loves the first 3 chapters, yet has yet to see the rest of the book. I have to be prepared for this eventuality, which is daunting, but your words here give me courage, and, of course, you’re right! Reading this well-crafted post has made my day, and I thank you! I am honored by your comments, Claire. I gave you courage? You always inspire me. I guess the publication process doesn’t get easier even for those who have already published. Thank you for everything you wrote. I debated whether to read Go Set A Watchman, because I had doubts about Lee’s agreeing to its publication. Ultimately, I did read it but as a writer rather than a fan. In fact, I read it back to back with Mockingbird because I wanted a sense of what changed. I could see Mockingbird’s roots in Watchman. I could see why the agent/editor who initially read it wanted the story of young Scout instead. I also saw a lot of “rookie” mistakes (oh, the head hopping!) It was an instructive read. Thank you, Ilene, for another perspective about the deepening debate over Watchman. You raise some intriguing ideas. I plan to read it after all just to make my own comparisons. Do you have another K book you would recommend? There are a bunch of mystery detective novels beginning with K, but the genre is not my favorite. My list does not include everything I’ve ever read in any category, so books I disliked (The Known World by Edward P. Jones – I couldn’t even finish it) aren’t on my list. Two K books on my list of books I want to read: Kavka on the Shore by Haruki Murakami, and Kaaterskill Falls by Allegra Goodman. I also want to read Kabul Beauty School by Debbie Rodriguez, but it’s a memoir, not fiction. Some letters boast a huge number of wonderful titles, others, like K, showcase very few. How is your WiP coming along? I love your premise. So, I don’t know how one writes another book after finishing To Kill A Mockingbird. I was in high school when I first read this, then I saw a version as a movie while in college and then reread the book shortly after. I believe it’s time to read it again, Shari. Thank you for the reminder. Oh, and Kite Runner was my K book, as I was reading it came to mind. Of course you brilliantly mentioned it at the end. Very good. Audrey, I didn’t even know how to read another book after reading Mockingbird which is why I read it immediately again after the first reading. I’d actually started to write about The Kite Runner and then switched to Mockingbird. Hard choice between two incredible books. dear Sharon, you & I are both passionate about books, so I hope you’ll forgive me for differing with you. I read Go Set a Watchman & loved it. For as much as I adore Mockingbird, Watchman is also wonderful, but in a very different way. Mockingbird safely endears readers via clearly ‘good’ and ‘bad’ characters. Watchman is the sequel to Mockingbird, not an early draft of it. Its an entirely different story. In Watchman, Mockingbird’s child characters are adults. from what I’ve read, Harper didn’t release Watchman earlier for fear of upsetting people. I read of some debate over whether she willingly published it, senility, etc. After reading Watchman, I’ve concluded that Harper needed to wait till she felt the timing was right, in personal terms as well as broadly. Daal, I’m pleased that you offered such a well considered response, including valid reasons for supporting a different point of view. Considering your thoughts here and those of a few other readers, I may decide to read Watchman after all. I’d like to make my own observations and draw my own conclusions. Originally, I didn’t want to be disrespectful to Harper Lee, but the mysteries around the book are compelling. I feel honored to host anyone’s reply as long as they are respectful to my readers and to me. Because of the controversy and the considerable discussion on my blog, I will write a review of Watchman. Thank you, I am seeing several other sides to Harper Lee’s career. Always something to learn. Not quite sure I should write this, Adrienne, but you made me smile. I’ve written tons of stuff on my computer not meant for anyone else’s eyes – I imagine the first thing my computer savvy sons will do is wipe them clean. I’m also pretty confident no one wants to read them. Another grin here.